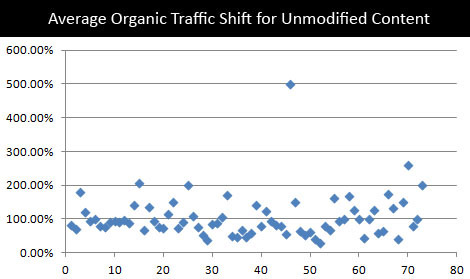 The objective of this study is to determine whether content optimization solely driven by nTopic recommendations impacts organic search traffic from Google. The study used 3 randomly applied treatments of nTopic modified content, random keyword modified content, and unmodified content. nTopic modified content saw an organic traffic lift of 17.5%, random keyword modified content saw a 10% drop and unmodified content saw drop in traffic of 15%. This indicates that nTopic optimized content can create increases in organic search traffic that cannot be explained solely by content freshness measurements or random fluctuations. The cohort modified by nTopic recommendations saw an average shift in traffic of 131.48%. This traffic shift corresponded with both the second and third metrics. 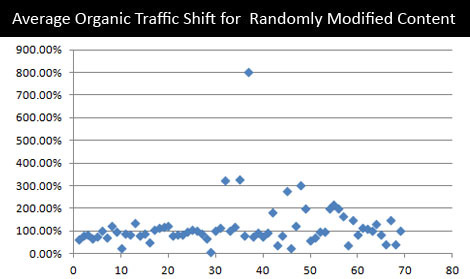 When all traffic was combined, the nTopic modified content still saw a 116.17% traffic shift, the only cohort to record a positive number and which was more than 30% greater than random. Perhaps most importantly, 63.49% of the nTopic modified content had positive growth, while only a minority remained the same or lost traffic. 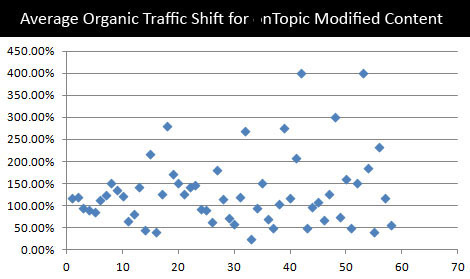 Blind insertion of nTopic recommended keywords to content can increase organic Google traffic, and that improvement cannot be described as caused by freshness ranking factors. We cannot conclude that topic modeling or content relevancy is used in Google's algorithm. We cannot determine the exact mechanism by which nTopic recommended keywords increase Google traffic. We can, however, provide evidence that insertion of nTopic recommended keywords do increase Google traffic.